Advisers basically deliver three kinds of value: analysis, process management and results. In M&A projects with many constituencies and sensitive agendas (e.g., acquisitions, mergers, trade sales, integrations, etc. ), an important part of value creation may be related to how the project is managed in order to achieve non-financial results. 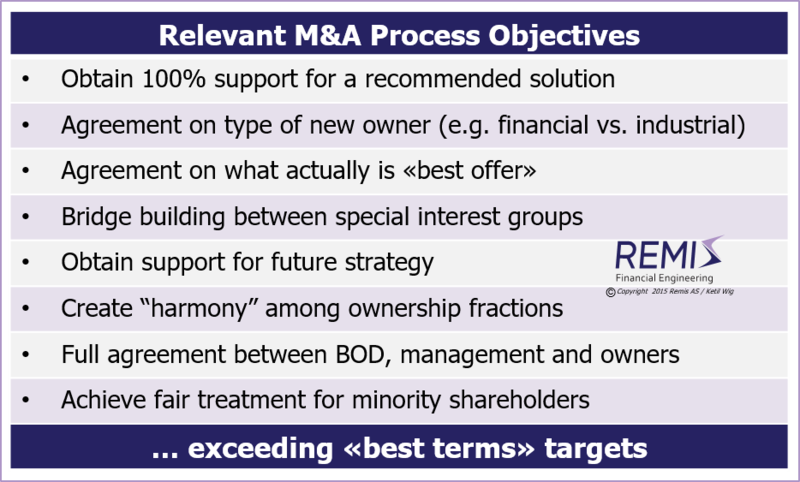 An example of a non-financial objective is to run an M&A project in a way which creates acceptance of a solution from all owners; another may be to bridge a dilemma between industrial vs. financial ownership (e.g., preferred by employees vs. preferred by external shareholders). To manage M&A projects in a way that creates these kinds of additional values requires management skills far beyond "finance" (which is the rather trivial part). Other ingredients include the ability to create trust and support between parties having different motives and objectives, develop win-win solutions (and have them accepted), apply empathy and listening skills, pull critical issues out of a complex situation – to focus on the essentials, and then translate these key factors into perceived value for each participating party. The process part of an M&A project consists of navigating between different constituencies in an optimal sequence with balanced focus in order to create results related to non-financial objectives. Which non-financial objectives are essential, and why? Who are the constituencies? What are their motives? What are the critical issues for each party? What combinations of solution elements represent a win-win between the constituencies, and to what extent? How should the different parties be involved? How much? When? In what sequence? In what way?